A view of wealth with Wealth Strategist and Advisor Judy Hulsey. Wait What Really OK Podcast Episode 94 hosted by Branding Strategist talks about wealth management for today and not just retirement with Judy Hulsey. I talk with Judy Hulsey about her book coming out next year called a view of wealth. Undoing oversaturated assumptions and placing them with personalized journies of success. Judy maintains that it is as important to live your life and plan for the life you want to live as you prepare for retirement and legacy as well. Too many focus only on the end or preparing for retirement. There is more to life and there is more you can do for your life than just plan for the end of it. Live the best life by planning with the best decisions to make the most out of your life and your dreams. 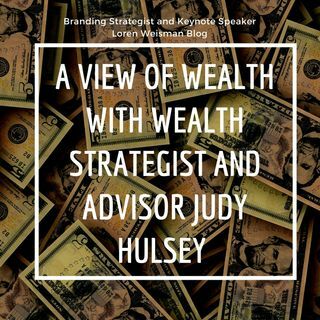 Episode 94 of the brand strategy podcast Wait What Really OK is called A view of wealth with Wealth Strategist and Advisor Judy Hulsey. The show is available on iHeartRadio.